The Vortex Brake Pads 200 held at Mosport International Raceway was race two of the thirteen contested during the 2010 NASCAR Canadian Tire season. Twenty-six drivers would compete on the ten-turn 2.459-mile road course for fifty-one- laps. 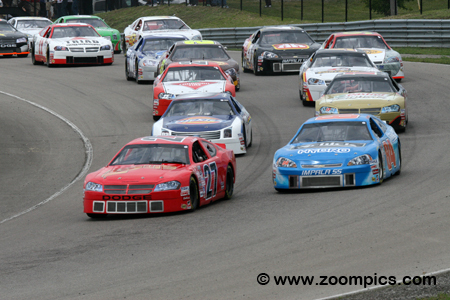 Twenty-six competitors funnel into Mosport’s very quick corner one for the Vortex Brake Pads 200. Leading the field is the pole-sitter and defending series champion, Andrew Ranger in the Dave Jacombs owned Dodge. On the outside of Ranger is the second fastest qualifier, J.R. Fitzpatrick in the Schick Hydro Chevrolet Impala SS. Behind the front row are third and fourth place starters, Kerry Micks and D.J. Kennington. 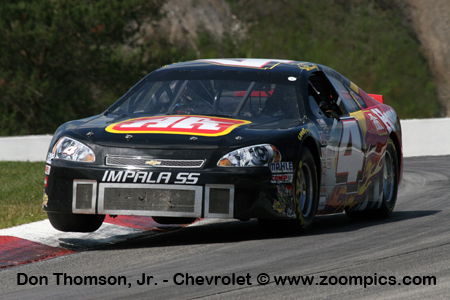 J.R. Fitzpatrick opened the 2010 season with a runner-up finish at Delaware Speedway. The driver of the No. 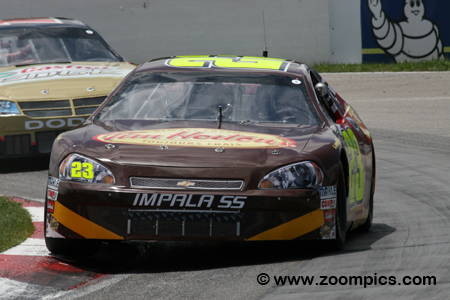 84 Chevrolet Impala SS missed capturing the pole at Mosport by just 0.123-seconds. By lap-5 of the race, Fitzpatrick was in first place and took turns leading the event with Andrew Ranger and Jason Bowles. On lap-28, he was back out front for the final time and held the position to the checkered flag for his fifth series victory. In qualifying, Andrew Ranger the reigning NASCAR Canadian Tire champion and defending race winner scored his sixth series pole-position. In 2010, Ranger’s main focus was on the NASCAR K&N Pro Series East and, he would only be making limited appearances in the Canadian championship. During the race, he led a total of nine-laps but could not match, J.R. Fitzpatrick’s pace during the last half of the event and finished second. 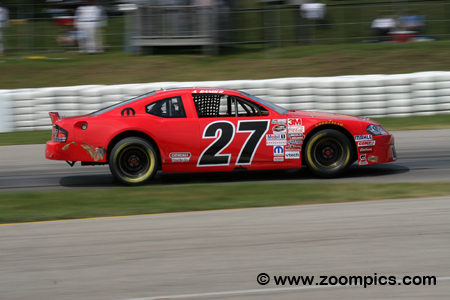 American, Jason Bowles was making his first NASCAR Canadian Tire Series start at Mosport. Bowles was the defending NASCAR K&N Pro Series West champion. Despite his lack of familiarity with the track, he got up to speed quickly. 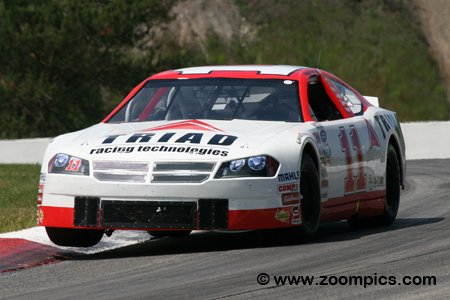 Bowles qualified eleventh in the Triad Racing Technologies Dodge. A decision to not change tires during the contest gave Bowles track position and was instrumental to his third-place finish. The driver of the No. 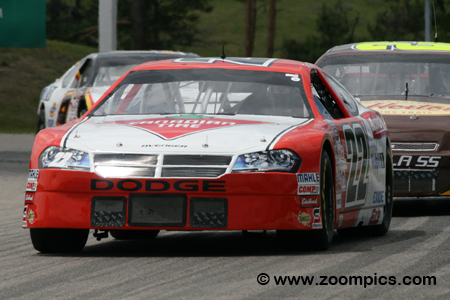 22 Canadian Tire/Motomaster sponsored Dodge was Scott Steckly. The 2008 series champion was at the top of the time charts in practice and fifth fastest in the qualifying session. Steckly spent most of the fifty-one-lap race running in fifth. By lap-45, he had moved into fourth place and maintained the position to the checkered flag. During Sunday’s qualifying session, Kerry Micks driving the No. 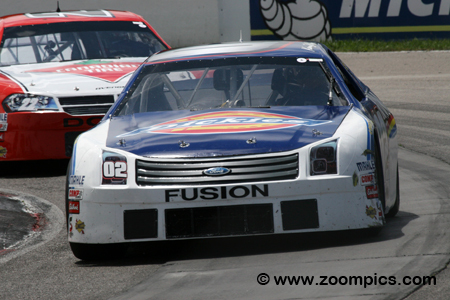 02 Beyond Digital Images/Dickies Ford was third quickest. The veteran competitor finished ninth in the season opener at Delaware Speedway after a third-place start. Like Scott Steckly, Micks ran with the leaders for the entire contest. It appeared that he would finish fourth but with less than ten laps remaining, Micks lost a position to Steckly – he finished fifth. Pole-sitter and winner of round one at Delaware Speedway was D.J. Kennington. The point’s leader was fourth quickest in qualifying driving the Castrol Edge Dodge. Kennington was also a contender during the event. In the race, he alternated between a high of fourth and a low of seventh place. On the final lap, Kennington battled for the sixth position with Jeff Lapcevich and was successful in the keeping the spot. Jeff Lapcevich also opened the season with a good finish – a third at Delaware Speedway. 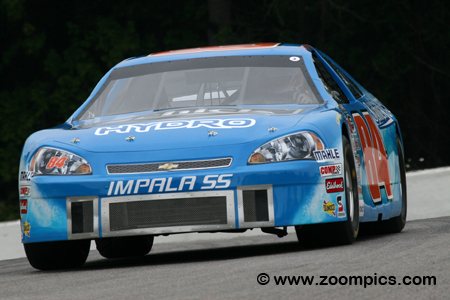 In round two at Mosport, Lapcevich was gridded seventh for the start of the Vortex Brake Pads 200. Driving the No. 23 Chevrolet Impala SS with backing from Tim Hortons, he kept in touch with the leaders during the contest. On the white flag lap, Lapcevich attempted to pass D.J. Kennington but had to settle for seventh place. 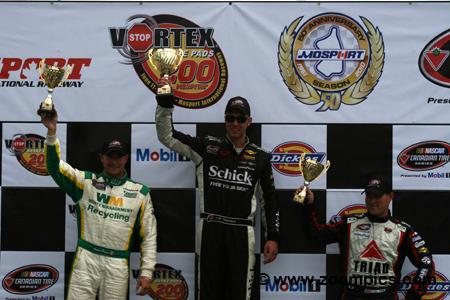 The NASCAR Canadian Tire Series podium for round two at Mosport International Raceway. On the left is the runner-up and defending race winner, Andrew Ranger. To the right is the reigning NASCAR K&N Pro Series West champion and third place finisher, Jason Bowles. Between these two is the winner and new championship point’s leader, J.R. Fitzpatrick.